Is polluted environment making your skin dull and unappealing? 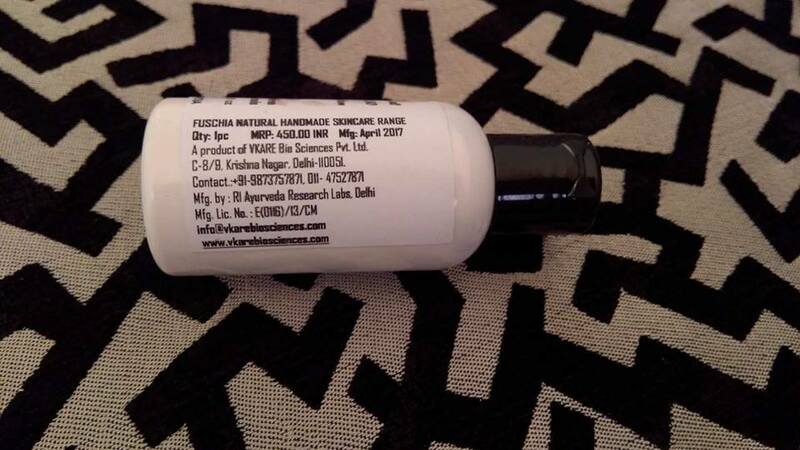 Well no need to worry anymore because Fuschia presents you paraben and phthalate free Sunscreen Matte Gel . The blend of aloe vera, olive oil and licorice extract are perfect to harmonize your skin & protection against sun-induced skin damages. Aloevera and olive oil cure the damage caused by sun rays & can treat sunburns as easily as it can slow down the aging of the skin. SunCat DE acts as a sunscreen agent, anti-oxidant, anti-aging and protective agent. This attractive new sunscreen matte gel gets absorbed in your skin instantly and protects adequately from UVA & UVB rays. 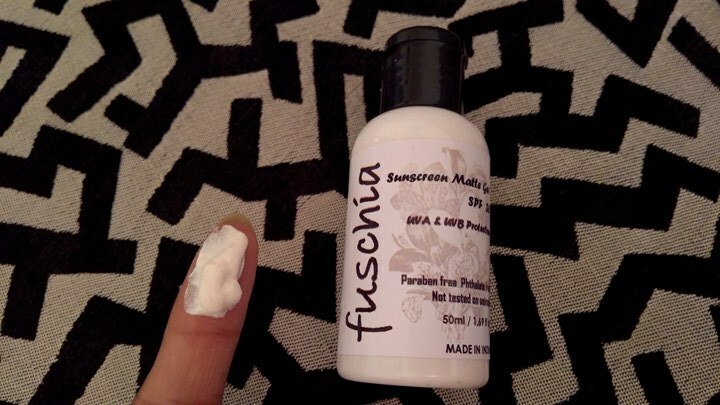 Fuschia Sunscreen Matte Gel comes in a small plastic bottle in white colour. There is black screw cap on bottle with flip opening over the top. The spout enables easy dispense of product. The information like ingredient list, mfg date, shelf life, price etc. 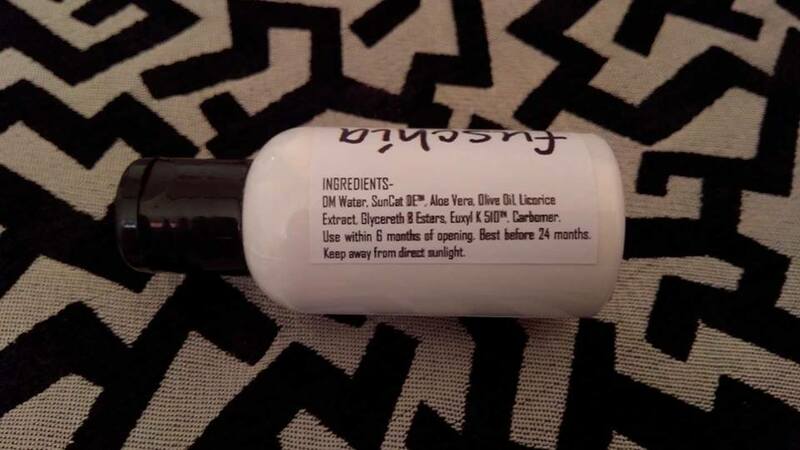 is printed on the bottle label. The texture of the sunscreen is of a moderately thick cream. The term ’gel’ used in the product name sounds misleading to me as the product is not gel-like either in texture or appearance. Despite the consistency, the sunscreen spreads easily on skin and gets absorbed as you massage it into skin with gentle strokes. The product stands to its claims of ‘matte’ effect. You will notice that the product leaves no shiny, greasy layer on the top surface of your skin after it sinks into skin. 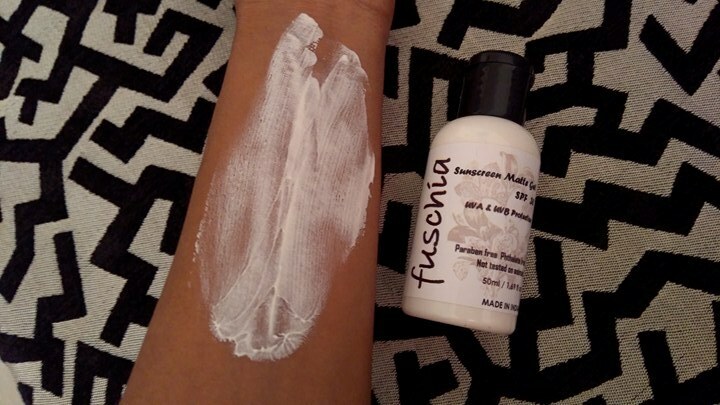 It may serve as a great choice for people who struggle picking a suitable product for their oily skin. For people like me whose skin is more on drier side, the product may be bit more drying so a layer of moisturizer underneath will make the feel of sunscreen much comfortable on skin. The sunscreen smells really nice, that’s something sweet and floral which most people would like. The smell is not sharp or overpowering, but cannot be considered mild too. Only people who are extremely sensitive to fragrances may find it strong, else it’s an easy-to-go-with kinda fragrance for most people. 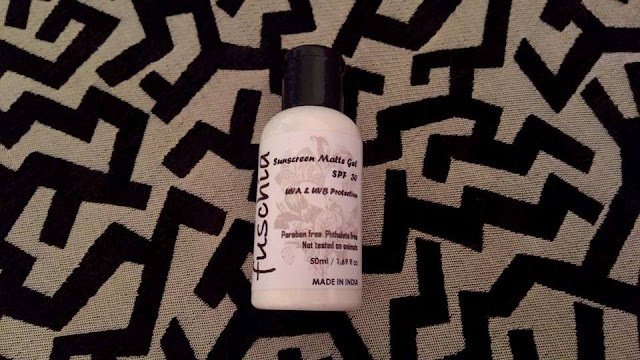 Fuschia Sunscreen Matte Gel is formulated with SPF 30 for UVA and UVB protection which could have been on higher content, but is reasonably enough for sun protection in warmer regions like ours. Now coming to the affordability of the product, I feel Rs 450 for a 50ml packaging will certainly pinch pockets of many of us (though the brand keeps on offering certain percentage of discount on its products regularly).